Stacks are easy to recognise because they stand alone, no longer attached to the cliffs. At high tide they will usually be tall rocks rising from the sea just off the shore, though at low tide you may be able to walk out to them across the beach. 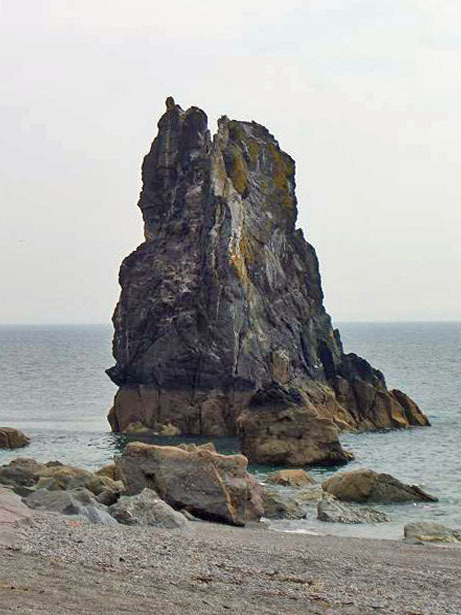 Stacks form when there is an area of weakness in the cliffs that can be attacked by the sea, weakened further, and eroded away. The most typical way in which this happens is when a weakness in an exposed headland becomes a cave, the cave is enlarged from both ends to form an arch, and finally the top of the arch collapses leaving the seaward pillar (the upright bit nearest the sea) as a stack. You will have realised now that stacks are erosional features, because they are formed by erosional processes. The presence of isolated stacks may indicate a change in the type of rock forming the cliff line. For example, a volcanic intrusion or a lava flow may be much more resistant to erosion than the surrounding rocks. Over time the softer rocks erode away leaving a strip of much more resistant rock exposed to the sea. Harder rocks will stay around longer, increasing the chances of the rock remaining long enough for a stack to be formed. You can deduce from this that very soft and easily eroded rocks are unlikely to form a stack because they will not withstand the action of the sea for a long enough period of time. 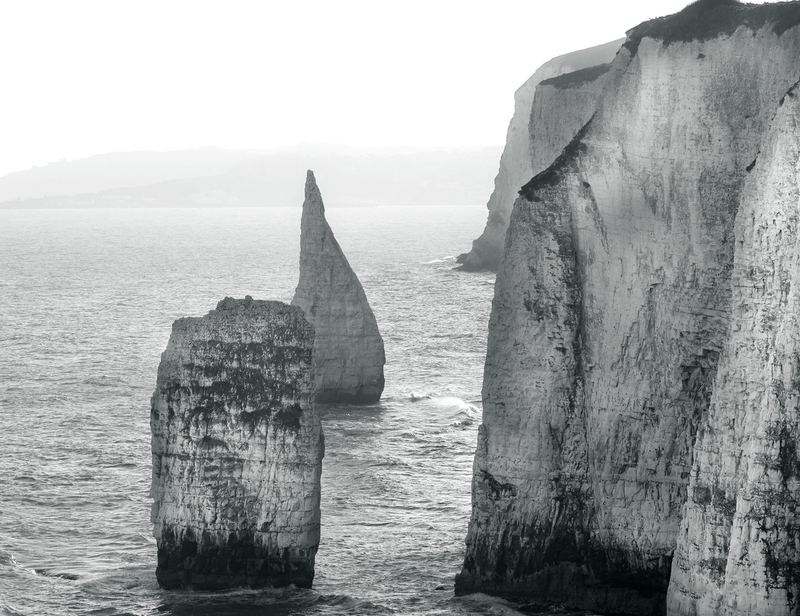 Sometimes a line of stacks will be formed, such as The Needles off the Isle of Wight,UK. When this happens the stacks furthest from the coastline will often be more worn down than those closer to the shore because they are the older ones. Over time, all stacks are worn down. A stack that has been reduced to a short pillar is known as a stump. Stumps may be hidden at high tide and only become visible as the tide goes out. In Dorset, positioned between Swanage and Studland, is a chalk headland called Handfast Point. Just off the end of the headland are three chalk landforms known as Old Harry Rocks. These rocks which were once part of the headland but have been cut off from it by erosion includes sea caves, arches, a wavecut platform and an impressive set of sea stacks. To the south of Old Harry rocks are a series of stacks called The Pinnacles, two of which are shown in the photograph to the right. The entire area is an important tourist location owned by the National Trust. The South West Coast Path follows the top of the cliffs alongside Old Harry and The Pinnacles, enabling tens of thousands of visitors to explore the coast and see the coastal landforms.